Originally from England, Beryl has lived in Canada since 1967 and is a civil marriage commissioner appointed by the Province of Alberta. She has conducted hundreds of weddings during the past twenty years of her appointment. She is the mother of Dawn and the grandmother of Nicholas. Continuing involvement with her community, as well as the many weddings she has conducted, make Beryl well known within western Canada. Beryl will conduct your marriage ceremony in any one of the beautiful locations in and around Jasper National Park; locations such as Pyramid Island, Maligne Lookout, Fairmont Jasper Park Lodge and many other beautiful spots. She will make your wedding ceremony a comfortable and enjoyable experience, and certainly a day to remember! As well as wedding ceremonies, Beryl will conduct 'renewal of vows' ceremonies for which there are no legal requirements. Renewal of vows can be conducted in the location of your choice in Jasper National Park. 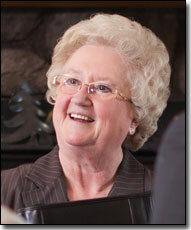 Beryl is a member of Jasper Tourism and Commerce.